Whether it's for a backyard or a complex, LED Spot carries lighting kits for tennis courts, baseball/softball fields, horse arenas, and other recreational fields. In addition to pre-designed lighting kits, we can accomodate custom projects of any size or budget. If you don't see what you're looking for, give us a call at (281) 972-5006. Metal halide tennis court fixture with a forward throw distribution. Uses 1000 Watt lamp and runs on 120-277V. Comes with curved mounting arm. Tennis court lighting fixtures with energy efficient LEDs. Uses forward-throw distribution for ideal court lighting. Includes fixture, arm, and mounting hub. All-inclusive lighting kit designed for tennis courts. Includes fixture, pole, and mounting arm. LED lighting kit for tennis courts. Comes with LED fixture(s), pole, and mounting arm. Mounting arm for LED Courtblade fixture. Comes with pole hub to fit on any 4" pole. Tennis court lighting package for recreational and residential courts. Six light system tailored for individual tennis courts. Tennis court lighting package for tournament and club courts. Eight light system tailored for individual tennis courts. Tennis court lighting package for dual courts in residential or recreational areas. Tennis court lighting package for dual courts. Intended for club or tournament lighting. LED lighting kit for single tennis courts. Choose between direct burial or anchor base mounting. Tennis court package for tournament and club style courts. Uses eight fixture configuration for optimal lighting. 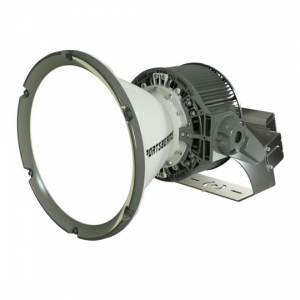 Lighting kit designed for recreational or residential tennis courts. Illuminates dual courts with long-lasting, sustainable LED fixtures. Energy efficient lighting kit for dual tennis courts. Available in bronze, white, black, and green. Round wood pole brackets fitted for fixtures with an adjustable slip fitter. Lighting kit attachment for wood poles. Great for horse arenas, farms, and various outdoor lighting applications. Horse arena lighting for wood poles. Available in 250, 400, or 1000 watts. Three fixture lighting kit in black, bronze, green, or white. Easily mounts to wood poles.